Last Minute Opening - Wed. April 17-22!! Attention Snowbirds looking for 2020 ** Our condo unit 267 is open for the first time in 10 years. Yes, our guests love our condo and come back year after year so we rarely have an opening. If you are interesting please CALL me. Hint - Read our info in detail. Stay right on the beach! Newly renovated early 2017. We also added at the end of 2017 a new sleeper sofa and love seat to the living room area. Our condo looks great and just waiting for you to spend a wonderful and relaxing vacation at the beach. Please feel free to call for more 423-238-8555. No worries here - no streets to cross. Mainsail is a private gated beachfront community that is located on 15 acres. It is ideally located at the end of Scenic Gulf Drive very near the Silver Sands Shopping area. Many dining options and activities for all family members are nearby. You cannot ask for a better location. Mainsail is near so much, but once you are on the Mainsail property you feel as though you are away from it all. You can find your place to relax or stay active - at the pool, beach, playing a game of tennis or shuffleboard. You might also want to play a game of beach volleyball on the pristine white sand beaches that are just steps away. We are also located only 20 minutes from the Seaside/Watercolor area and 45 minutes from Panama City Beach. This very well maintained and updated condo features 2 bedrooms and 2 baths. The living area is a large open floor plan which includes the kitchen and dining areas. The balcony is a great place to read or have that morning cup of coffee. It offers great views of the pool, beach and the Gulf. Television in each bedroom. 42' flat screen TV in living room with DVD. * Master bedroom has king bed with private bath. Bath/shower and toilet are separate from the double sink vanity. * Second bedroom has a queen bed and we have also provided a twin aero bed for your convenience. Second bathroom is located right next to this bedroom. The condo also comes fully furnished with a full size washer and dryer, dishwasher, frig with ice maker and microwave. All cooking utensils and linens are provided. Free Wi-Fi is available at the condo. You will not be disappointed should you decide to stay at our Beach Retreat. So, if your ready send us an email or give us a call. Before you know it you will be sitting on the balcony, having your morning cup of coffee or afternoon cocktail while listening to the pounding surf and viewing the Emerald Green Waters of the Gulf of Mexico. We do not rent to anyone under 25 years old. No pets are allowed. Call or e-mail for more information on this great vacation rental. We purchased our first condo in Destin in 1997. We loved this condo, but it was across the street from the beach. Our goal was to someday have a condo on the beach and so we purchased our condo at Mainsail in 2003. We have enjoyed our condo with our 2 daughters for many years. We hope you and your family enjoy our condo and create many wonderful memories. You will really love Mainsail and its location. You can be right in the middle of things, but once you're at the condo you feel away from it all. There are 700 feet of sugary white sand beach right out in front of Mainsail. Included in your rental are 2 beach chairs and 1 umbrella that is set up for you each day of your stay. 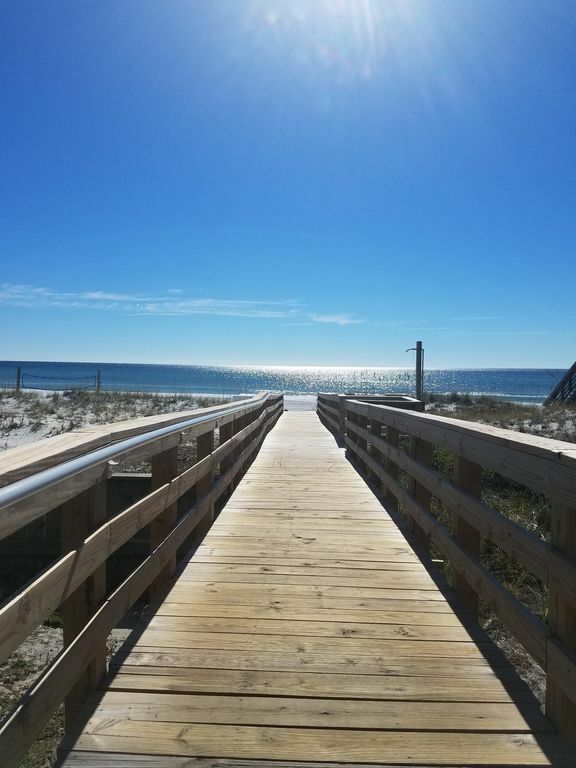 If you don't want the beach (not sure why this would be) you can find wonderful shopping, movie theaters, restaurants, and family entertainment practically right at the front of the main entrance to Mainsail. Your vacation condo is located in building two (unit 267), which allows for a very nice view of the beach and the main pool area. You can also play a game of tennis or shuffle board. The condo has two bedrooms and 1208 square feet of total living space. Many newer condos are much smaller and do not have the large living room and master bedroom like this condo. We are very particular about keeping the condo up to date and very well maintained. Extensive renovations occurred last quarter of 2016. You will be very happy should you decide to rent this condo for your next vacation at the beach. Bathroom #1 is off the master bedroom. There are double sinks. The sink and dressing area is separate from the toilet and tub area. Six can sit at the table. There are two seats at the bar.